Breeding tells. The love of Thoroughbreds—whether for their speed, agility, or beauty—is a bred-in-the-bone mystery not readily explicable to the non-equestrian. To celebrate this time-honored bond between man and steed and the great tradition of horsemanship, Luxury Defined has assembled an international collection of properties dedicated to the Thoroughbred. From a historic farm in North East Scotland to a grand country manor in Pennsylvania horse country, these are the well-bred, architecturally elegant estates where residents—both human and equine—will find creature comfort and respite after a long day in or under the saddle. 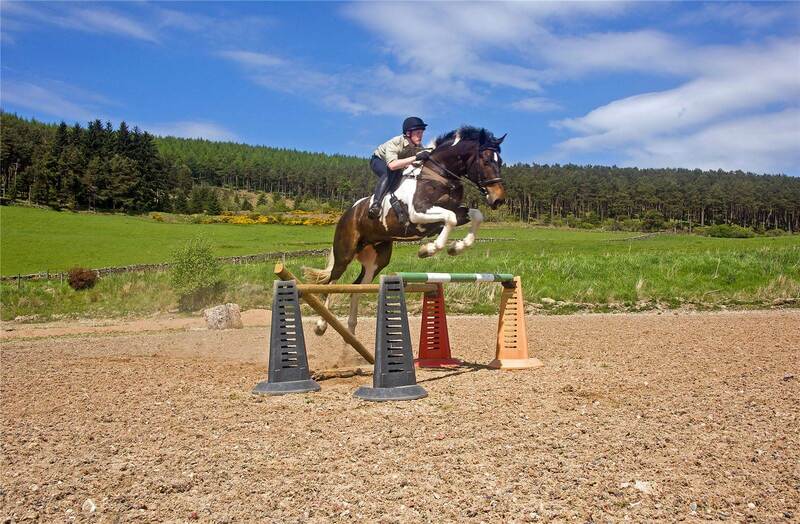 Whitehills Farm is an event rider’s paradise amid the forests and moors of northeast Scotland. Originally built in 1896, Whitehills Farm is a south-facing granite farmhouse overlooking the Hill of Fare and Pitfichie Forest, near the village of Monymusk in Aberdeenshire. The property was completely renovated in 2007, more than doubling the floor area to include six bedrooms, four bathrooms, a huge open-plan country kitchen, and dining and sitting areas with panoramic views across the valley. Off the courtyard is a traditional stone-and-block stable with seven horse stalls. The west wing, also crafted from stone, incorporates a feed room, tack room, loft, wood store, and three stalls. Behind them, two modern steel-frame buildings accommodate six more stalls, tack and feed rooms, and a hay barn. Offered in a separate or combined sale are Pitfichie Fields, seven fields comprising about 47 acres on the south side of the valley. All currently in grass, they are ideal for training event horses due to their varied contours, drops, water crossings, and all-weather grass gallops. Discovery Manor, a 160-acre horse farm dedicated to the breeding, sale, and racing of Thoroughbreds, is strategically located in the heart of the Northeast horse-racing industry. The horse comes first at Discovery Manor. The pristine Amish-built equestrian barn is without parallel with its 24 oversized stalls, foaling center, owner’s office, tack room, and barn manager’s apartment. Nearby is an eight-stall quarantine barn, equipment building, exercise ring, turnouts, fenced pastures, and a farm operations center, housed in a circa-1890 farmhouse. Designed for the enjoyment of family and friends, the classically inspired main house presents 25,000 square feet of artisan-crafted, furnished interiors. Highlights include a 24-seat formal dining room, gourmet kitchen, conservatory, great room, 3,500-bottle wine cellar and tasting room, 12-seat movie theater and game room, and fitness center. Two upper floors house the estate’s business office and seven generous en suite bedrooms. A pool patio with an oversized pool and spa, summer kitchen, and fully equipped pool house lend a resort-like atmosphere to this world-class equestrian property. River Oak Farm has an array of facilities for sports lovers of all stripes: a 20-stall barn, riding arena, paddocks and trails, soccer field, basketball court, tennis court—plus an infinity pool and spa in which to relax after the games. Inspired by the great country houses of England, River Oak Farm provides an incomparable lifestyle within proximity to Manhattan. 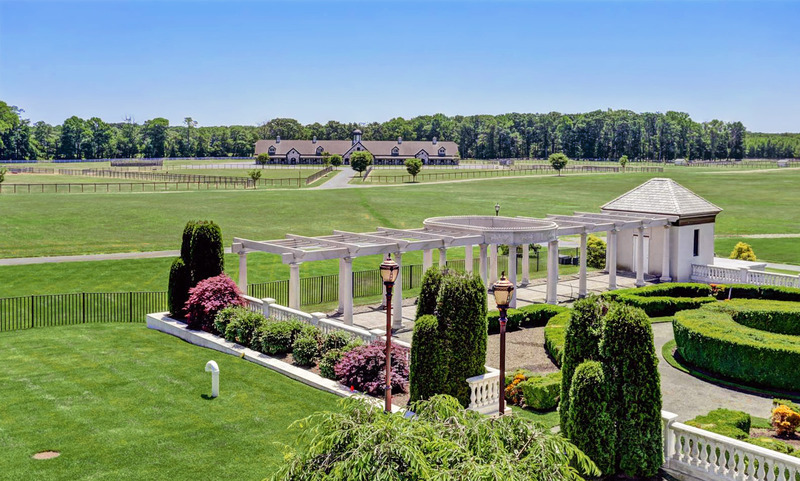 The estate occupies more than 45 acres along the Ramapo River, surrounded by a further 9,000 acres of preserved land. For the equestrian, there is a 20-stall barn, a vast indoor riding arena, paddocks, and riding trails. For the sports enthusiast, there is a soccer field, basketball court, outdoor infinity pool and spa, and sport lounges throughout the exquisitely landscaped grounds. 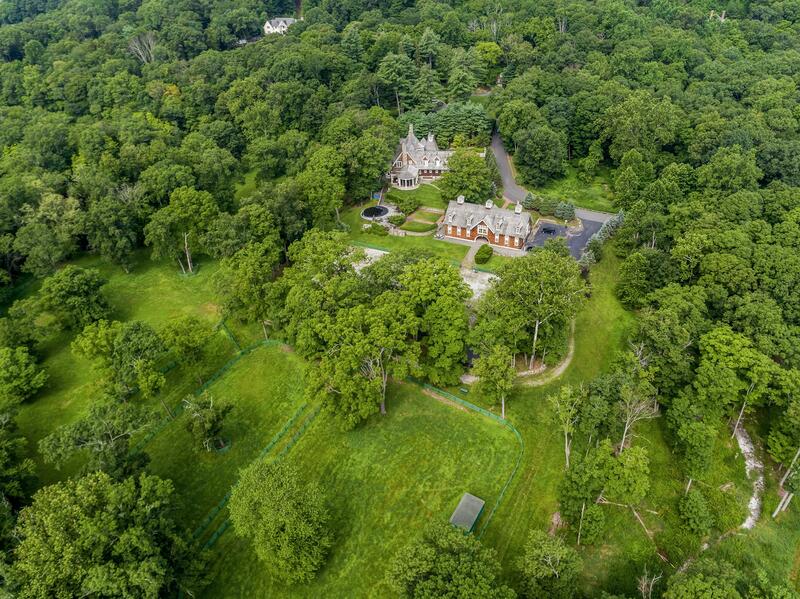 The grand stone mansion offers respite with a host of sensational amenities: 10 bedrooms including an expansive master retreat with a private spa, an indoor pool, massage room, gym, padded recreation area, wine cellar, library, home theater, and beautiful English pub and banquet room. View additional photos and more information on this special property HERE. One of the few true equestrian estates on the Big Island, this elegant Puakea Bay Ranch home combines the best of resort and rural lifestyles. 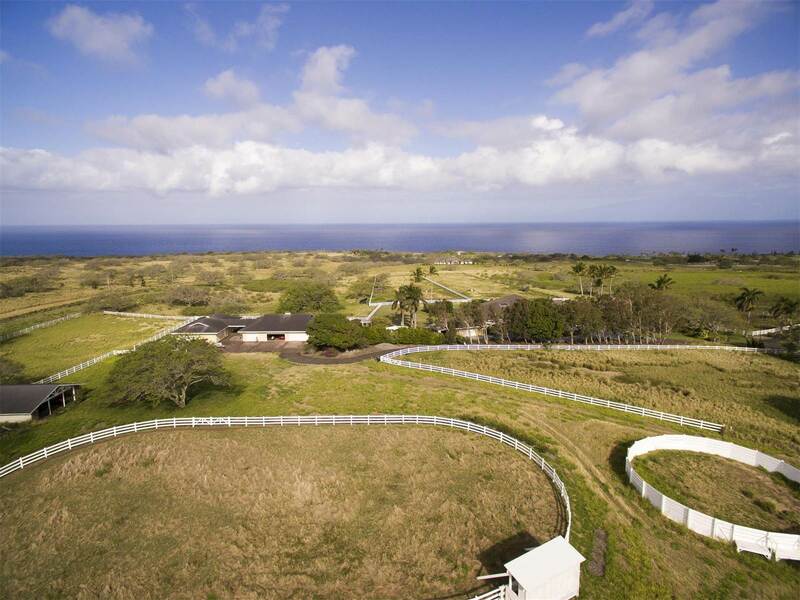 This 40-acre ranch estate offers the ultimate equestrian lifestyle in Puakea Bay Ranch, a gated enclave with miles of riding trails on Hawaii’s Big Island. Originally designed as a horse breeding operation, the property includes a main barn with seven stalls, an equipment barn, arena, round pen, and six fenced paddocks, served by five automatic waterers. Residents can retire to the beautiful 5,000-square-foot main house, which showcases ocean views from nearly every room. The guest house has a living area and two bedrooms connected by a covered walkway. The resort-style grounds provide additional recreation areas with a covered lanai, pool, and pool house. The estate has been built using the finest materials and the latest upgrades, which include renovations to the lanai bar and pool house, and the installation of solar heating in the pool. 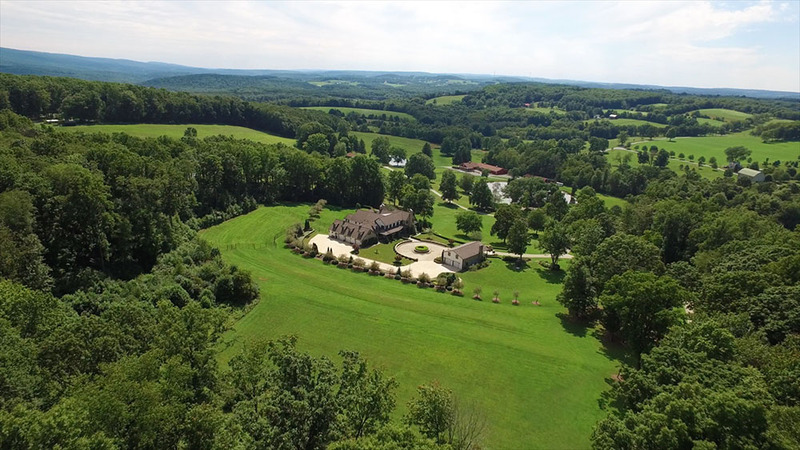 Evocative of the British sporting estate, this 504-acre Pennsylvania equestrian estate comprises a magnificent main house and equestrian barn with 15 stalls, run-in sheds, paddocks, fenced pastures, plus commercial-grade farm facilities. Galaxie Farm is a palatial Pennsylvania fieldstone farmhouse surrounded by more than 500 acres of pastoral grounds, within an hour of Pittsburgh. Built in 2002, the main residence accommodates grand-scale entertaining in the formal reception rooms, on the many covered porches, and outdoors on the stone patio or pond-side pavilion. There is a library, gourmet kitchen, and luxurious master suite; a three-season porch with fireplace adjoins the stone patio, office, and children’s study/play room. The lower level is complete with a wine cellar and tasting room, bar, and media area. The farm is equipped with superb equine facilities: 15 soft-floor stalls, two ceramic wash bays, a tack room, office, and hayloft. There are also paddocks, fenced pastures, and five run-in sheds, plus ancillary structures, including a machine shop, an outbuilding for fuel tanks and farm equipment, a caretaker’s residence, kennels, and for the auto aficionado, a three-car garage with a wash bay. 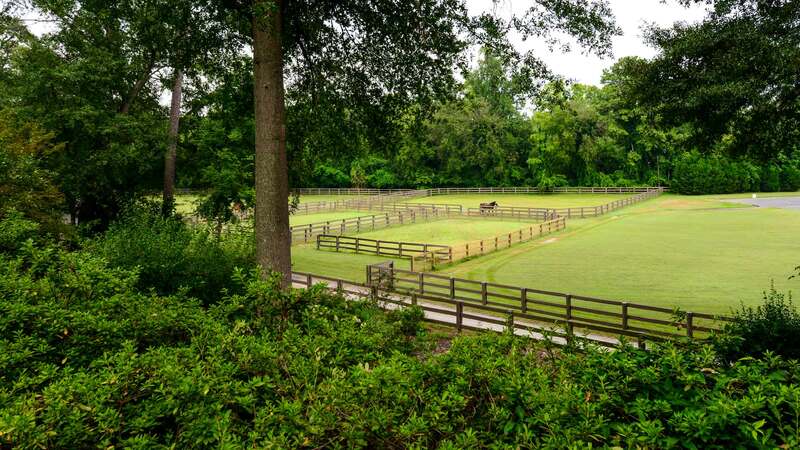 Dancing Horse Farm has outstanding facilities for horse and rider, including paddocks and an equestrian barn, just 15 minutes’ drive from downtown Atlanta. Dancing Horse Farm is an elegant equestrian estate in the exclusive Atlanta enclave of Buckhead. Surrounded by a pastoral landscape of fields and woodlands, the nine-acre grounds include four paddocks, a six-stall barn, swimming pool, and guest house. The beautiful four-bedroom main residence was custom-built with the finest finishes and craftsmanship. The fieldstone façade, slate roof, and refined interior details, such as custom ironwork and hand-hewn timber beams, impart an Old World ambience, while an open layout and luxurious appointments create an ideal environment for comfortable family living and grand-scale entertaining. A national monument in a World Heritage Site, De Eenhorn is dedicated to refined country living and equestrian pursuits, yet is only 15 minutes from the historic heart of Amsterdam. Founded by a wealthy merchant in 1682 as a country house and tenant farm during the Dutch Golden Age, De Eenhoorn is a top-100 Dutch national monument in the Beemster Polder, a UNESCO World Heritage Site and masterpiece of classical and Renaissance planning. The estate is a bucolic haven surrounded by rolling countryside, yet it is a comfortable, congestion-free 15 minute-drive from the center of Amsterdam—offering the best of both worlds. Encompassing more than 17 acres of grassland, orchards, and landscaped gardens, accessed through a monumental gateway, De Eenhoorn also provides 6,100 square feet of gracious interiors layered with luxurious amenities. Among the appointments are two lounges, a study, a gourmet kitchen, a library, five bedrooms, three bathrooms, and two guest rooms. The horses are also well accommodated: the stables have been updated with two top-of-the-line Corton stalls, an Agterberg flooring system, and a large illuminated trough. 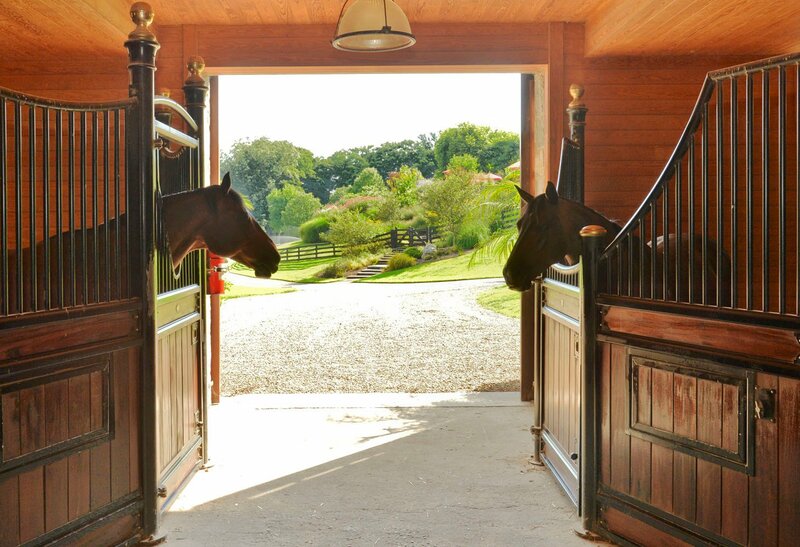 This riverfront estate’s outstanding amenities include a nine-stall barn, jumping area, paddocks, and riding trails along New Jersey’s Ramapo River. This elegant stone and shingle-style residence on more than 23 acres along the Ramapo River was designed by the Greenwich architectural firm of Shope, Reno and Wharton and constructed by architect James Nigro. The river views are breathtaking from the main residence and its pastoral grounds. The nine-stall barn opens to a limestone jumping area, expansive paddocks, and trails along the river. Above the stalls is an expansive artists’ loft with a separate living area with three bedrooms and two-and-a-half bathrooms. Other superb amenities include an infinity pool, hot tub, stone barbecue, and a generator. An additional 1.2 acres with two historic homes are also available for purchase. View additional photos and more information on this special property HERE. This 500-acre Texas ranch has an equine facility with custom-designed stalls, a wash bay, feed store, tack room, horse walker, and roping chutes. Ideally located less than an hour south of Dallas and Fort Worth and 10 minutes from the historic town of Waxahachie, this rare 500-acre ranch is a private paradise of bluffs, rolling hills, and spring creeks. The 8,000-square-foot main residence was built to an exacting standard. The interior is characterized by warm, inviting living spaces with classic rustic elements and ornate details. 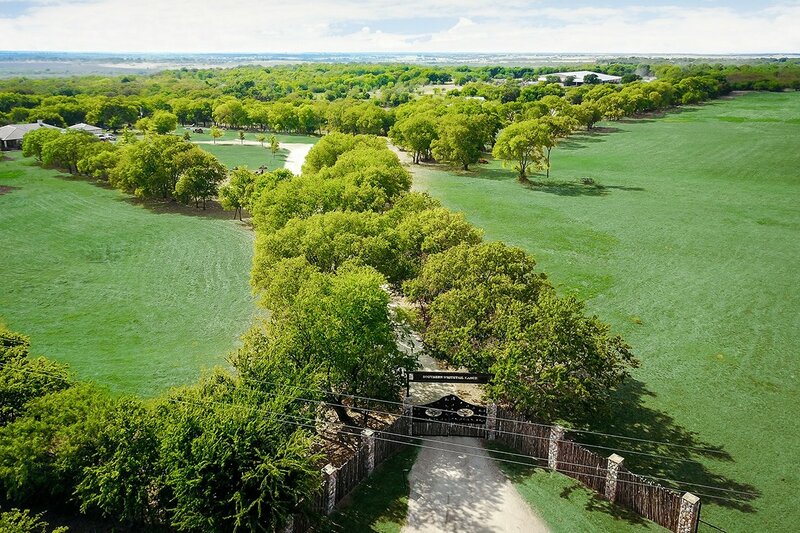 Equally outstanding, Southern Whitetail Ranch’s grounds host a range of amenities designed for the equestrian. The equine facility includes 12- by 12-foot Priefert stables with soft-stall flooring, a wash rack, large tack room, feed storage, and a roping area with chutes and a horse walker.